Annual May workshops at MISC, instructing hoodoo, ecumenical religious practices, and folk magic traditions from around the world. Hello all! I have to submit my 2019 vacation days request for work in the next couple weeks; do we have a ballpark weekend for next year yet? I’m going to try to ask for every weekend in May except Memorial Day weekend preliminarily. Thanks for any info! Looking forward to it! TEN HANDS-ON TRAINING WORKSHOPS over the course of two days! Psychic Readers and Therapeutic Massage on site! Free Continental Breakfast and Buffet Lunch both days! The value of the books alone is $48.00 -- and all participants will receive spiritual supplies for use in the workshops, plus four meals with drinks, at no extra cost above the ticket price. This is the most economical -- and LEARNING INTENSIVE hoodoo and folklore workshop program in America. Right now i am working with my colleagues Jon Saint Germain, Lady Muse, Papa Newt, nagasiva yronwode, Dr. Jeremy Weiss, Papa Gee, and Deacon Millett to bring this all together. In the meantime, if you want to meet me, get your festival tickets, because this is the last time that i will be hosting this show! The date has been selected: Saturday and Sunday May 11 - 12, 2019 in Forestville, California. As i announced about four years ago, i will turn 72 at this Festival and this will be the last Hoodoo Heritage festival that i (cat yronwode) will personally be hosting. The line-up of presenters and programs has not yet been set (we usually firm that up by December) and tickets are not on sale yet (they usually go on sale January 1st). However -- we have five (out of ten) TENTATIVE presenters so far: Lady Muse, Papa Newt, Miss Robin, Jeremy Weiss and me. And we have five TENTATIVE workshop topics (out of ten) planned (which i am keeping cool on for now). 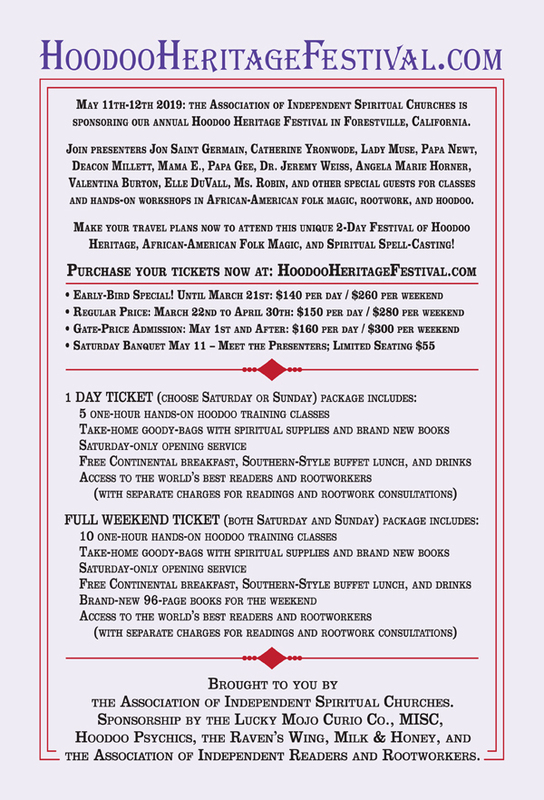 If you have been planning to come to a Hoodoo Heritage Festival to take workshops. hook up with the community, see me, take my Apprenticeship program, or hang out at the Lucky Mojo shop, this will be your LAST opportunity to do all five of these things in a single one-week time-frame. I intend to continue to teach my Correspondence Course and to hold Free Apprenticeship Weeks, but after May 2019, they will not be connected to the Hoodoo Heritage Festival. The organization that actually runs the Hoodoo Heritage Festival is the Association of Independent Spiritual Churches (AISC) and it will be the decision of the AISC Board as to whether there will be further HHF events after this one, if another host can be found. I have stated that i will be glad to participate as a teacher at any future HHF event, but at age 72, and after 12 straight years of doing the work, i am going to wrap up my hosting duties. Wonderful, thank you Miss Cat! You can bet I will be there that weekend! 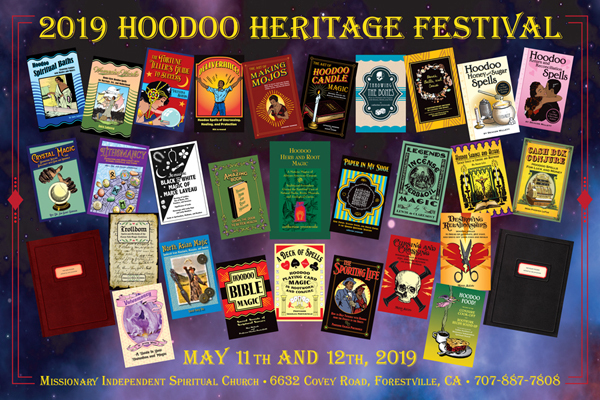 And just a reminder for our friends from the center of the nation: The 2019 Hoodoo Heritage Festival will be held on the weekend of May 11th and 12th in Forestville, California ... and the weekend AfTER the Hoodoo Heritage Festival -- namely May 18th and 19th, 2019 -- the annual Spring Mystic Fest will be held in Council Bluffs, Iowa, sponsored by Charlie Odorizzi of Next Millennium Books & Gifts in Omaha, Nebraska, and featuring our dear friend and colleague, Papa Newt. So if you can't make it out to see Papa Newt's West Coast appearance, be sure to catch a train, plane, bus, or car to check him out at the finest metaphysical fair in the midwest. Also, everyone who is planning on attending the weekend, you might want to think about making lodging reservations soon. May 12 is Mother’s Day, which will be busy in the glorious wine country. Folks often find ways to share rooms, to cut expenses. Also, there are now Air B'n'B places all around the county. I wish I can make it! Cat this must be such a special one for you if it will be the last you'll host! Well, 12 years of hosting these festivals has been quite a run for me. If anyone else takes on the job, i have promised that i will travel to attend and present workshops -- and if no one grabs at the chance, then these festivals will fade into memory, leaving two spectacular memory-books, the Black Folder and the red Folder -- the latter of which i am working on assembling right now. I hope you can make it out to visit. Hubby and I are FINALLY COMING! Already booked the flight, room, and car so no turning back now. Now heading over to get the tickets for the event. Ready to absorb everything! The 2019 HHF web site has been updated with lots of new information -- and it is time to purchase your tickets, while they are at their lowest possible price. This is going to be an amazing event -- the line-up of presenter will tell you that! -- and we are still adding new readers and features. We are moving ahead rapidly with our planned events for the 2019 Hoodoo Heritage Festival. Next planning meeting -- for AIRR members only -- will be Tuesday, February 5th, 2019, via Skype, at the regular Tech Team Meeting. Today we offered the upcoming book "The Secret of Numbers Revealed" to the public for pre-payment, scheduling it to ship to mail order customers on the day AFTER the Festival. As usual, Festival attendees have the price of this book included in their ticket-price, along with four other books and plenty of spiritual supplies for each workshop.